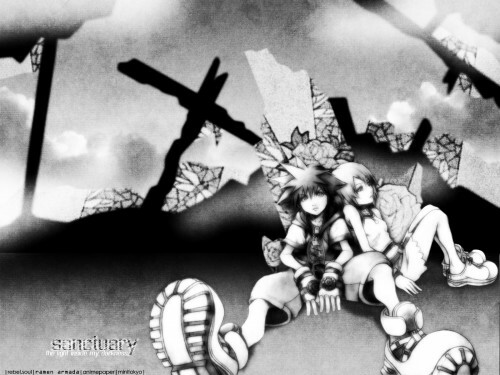 My entry for the first battle in WAR [AP WAR], theme: Kingdom Hearts, just 2 colors, in this case, black and gray. I try a lot of ideas until this one, some scans from KH2, different styles and colors, but after a while the idea of a broken sanctuary with stain glass broken and a whole destruction scene. Roses from a Rozen Maiden scan and the dragonflies taken from a stock pic, textures as usual from DA!. Maybe the only thing that i dont like is the text, but i cant work with it and try different styles cause i have to run before the deadline.